Consider a hypothetical clinical trial to treat interstitial cystitis (IC), a painful, chronic inflammatory condition of the bladder with no known cause that most commonly affects women. Two treatments will be compared: lidocaine alone ("lidocaine") versus lidocaine plus a fictitious experimental drug called Mironel ("Mir+lido"). The design is balanced, randomized, double-blind, and female-only. The primary outcome is a measure of overall improvement at week 4 of the study, measured on a seven-point Likert scale as shown in Table 70.34. 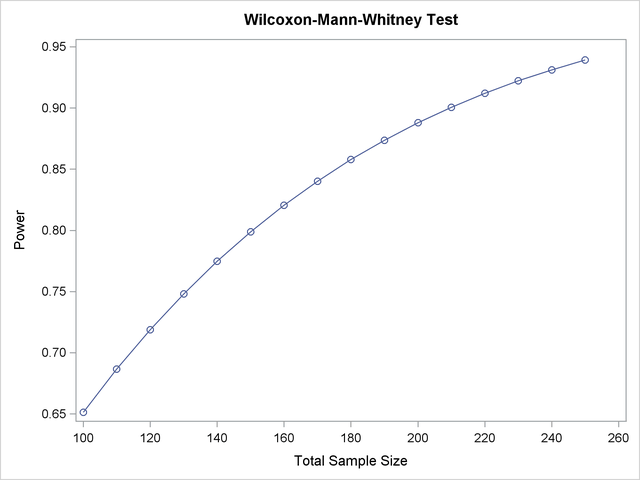 You are asked to graphically assess the power of the planned trial for sample sizes between 100 and 250, assuming that the conditional outcome probabilities given treatment are equal to the values in Table 70.35. The tabular and graphical results are shown in Output 70.10.1 and Output 70.10.2, respectively.